A British-living New Yorker, Huey Morgan is a very important supporter to the British Blues Exhibition. Huey is a Blues fanatic and musician who performs with his band Huey and the New Yorkers, and he is a BBC DJ. He knows and talks about the Blues with utter passion. 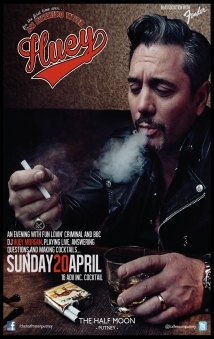 Huey is also well-known as frontman of the Fun Lovin’ Criminals and sometimes performs with the Tangiers Blues Band. The poster above refers to Huey’s 2014 appearance at the Half Moon in Putney, London – a venue that schedules many fine Blues acts.